How To Prepare Grilled Octopus. Serve with Grilled Oranges and Shaved Fennel Salad. When your Mediterranean vacation fades to just a fond memory, renew it with good food, make Grilled Octopus and Grilled Oranges with Shaved Fennel Salad. So easy to prepare, it is a great party dish and you'll be back at the seashore with very little effort. Two-steps for cooking octopus, first boil and cool down in the liquid, then grill. While some chefs recommend adding a bottle cork to the boiling liquid, I don't find it necessary. The first step is boiling the octopus in water flavored with herbs, pepper, citrus, garlic cloves, and no salt. Once the octopus becomes tender, turn off the heat. Then cool down by keeping it completely immersed in its cooking water until grilling so it remains tender. Refrigerate overnight in the same water if needed. Whole cleaned octopus weighing 6 ounces each cooks in 40 minutes; weighing 1 pound each cooks in about 1 hour; weighing 2 pounds each cooks in about 1 1/2 hours. Don't equate length of time with laborious preparations. Once the octopus is immersed in the water, you can basically ignore it. Simple. Either grill the same day or the following day. The second step is grilling quickly and briefly over very high heat on an outdoor grill or in a very hot grill pan. Serve at warm to tepid temperature so the octopus remains tender. Octopus is a high-protein, low-cal ingredient providing more than your daily recommended amount of selenium plus high amounts of vitamin B-12 and iron. Chock-full of vitamin C, oranges offer so much including vitamin A, potassium, and calcium as they grill-up beautifully, all smoky and juicy. Shaved into translucent arcs, crunchy fresh fennel bulb gives us vitamins C and A, potassium, iron, magnesium, and is great for digestion. With its mild anise-flavor, it is the perfect counterpoint melding sea with land, octopus with oranges. Healthy eating. 4 servings. Cooking time is 40 minutes to 1 1/2 hours for boiling the octopus, depending on its weight. Grilling time is up to 10 minutes. 1. Boiling the Octopus: In a deep pot, pour in the water and add the flavorings. Bring the unsalted water to a rolling boil. Add the whole octopus, partially cover the pot with the lid. Decrease the heat to medium-high and boil the octopus until tender – the tentacles fall limp and curl under the body and it can easily be pierced with the tip of a paring knife or fork. Turn off the heat, cover the pot, and allow the boiled octopus to cool down in the liquid so it remains soft and tender. If serving the following day, refrigerate the boiled octopus immersed in the cooking water. Drain the boiled octopus, and pat dry, just before grilling. 2. 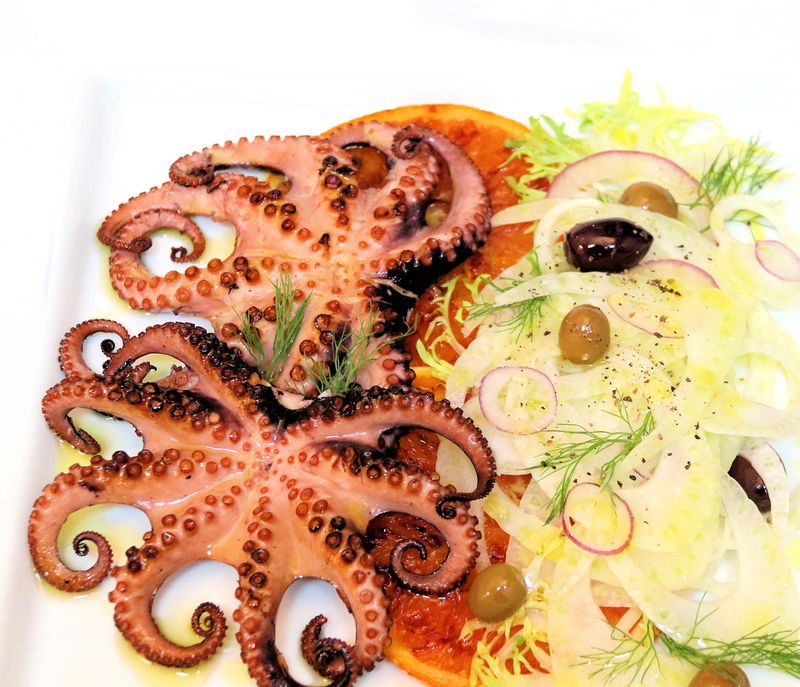 Grilling the Octopus and Orange Slices: Preheat the grill or grill pan. Lightly coat the interior with olive oil. Slice the octopus tentacles or leave the octopus whole. Place the drained boiled octopus on the grill, and cook for about 4 to 5 minutes per side, or until some edges become crisp and the octopus absorbs a little smokiness making it extra flavorful. Grill the orange slices for 1 to 2 minutes per side. Transfer to serving plates. Immediately drizzle with olive oil, and salt to taste. 3. Salad: This classic combination of raw fennel and onion with black olives can be plated in many styles. Only extra-virgin olive oil and fresh orange juice are needed as dressing for this refreshing salad. Preparation: Trim the fennel by removing the upper stalks and fronds, reserve for garnishing or for other dishes. Under cold running water, rinse the fennel bulb, drain, and pat dry. Olives: Drain if immersed in brine. Taste. If the olives are too salty, briefly rinse under cool water, drain, pat dry. Using a mandoline or sharp knife, thinly slice the onion, then the fennel. Toss both together and plate. Drizzle olive oil over, squeeze fresh oranges over releasing their juice, salt and pepper to taste. Serve immediately to fully enjoy the freshest flavor of crisp raw fennel and onion accented with olives and tender grilled octopus and juicy grilled oranges.